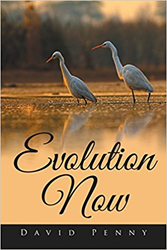 David Penny returns to the publishing scene with the release of “Evolution Now” (published by Xlibris NZ), an up-to-date view of modern evolutionary theory from a Popperian perspective. The book dissects the chronology of evolutionary study starting from 1600s when people accepted that life continued to arise “naturally,” to the pre-evolutionary concept of the fixity of species, to Darwinian thoughts, to the Out of Africa theory, and more. The book finishes with a section on what is left for the future. “In good Popperian style, there is a lot left for us to discover!” Penny says. Presenting a historical view of evolution, “Evolution Now” calls for a “true respect” for scientific knowledge. “There is an ‘anti-science’ view that the book challenges, whilst saying that not everything we ‘believe’ is true. But science is the only ‘true’ path to wisdom,” Penny adds. David Penny was born in New Zealand. He earned bachelor’s degrees in chemistry and botany, a doctorate degree from Yale University and is a distinguished professor at Massey University. He is a long-term student of evolution. “Evolution Now” is his second publication following “Molecular Evolution” with Eric Terzaghi and Adam Wilkins.